This entry was posted in Quotations and tagged Quotations on May 11, 2014 by Grannymar. Without laughter, I do not know how I would have managed to get through my life. I laugh at myself all the time. Life is absurd . . . here’s to laughing at it and us! As the saying goes: A day without laughter, is a day wasted! If that statement is true, I grew up the morning after my wedding. It took all those years? Surely not. I have never heard that Twain quote before. Fabulous. I loved it. Laughter lines curl up like smiles! Great sayings! So appropriate for all of us. Sometimes we need a reminder not to take life so seriously. Dublin wit is in a class of its own! I am familiar with that book and the TV series: Mrs Brown’s Boys, by Brendan O’Carroll. I thought you might be . . . but when I bumped into it this morning, I thought of you and your mammy. Yes, she was always ‘Mammy’ to us, It was when the grandchildren were around that we called her Nana! *quibble* Those are more than one line! I wonder why I battle so to get to a stage where I can do more than look at your blog? I had reached the conclusion it was non-interactive! Good lord! I had no idea how much I must have been smiling throughout my life. P.S. I have responded to many of your posts and have yet to receive even one penny. Am I taking you too literally? Al, at least the laughter lines curve upwards. Oh I take life very seriously, it may be the only one I have. Besides, how do you explain the wrinkles where the sun don’t shine! Mark Twain was wonderful and politically very serious, but sometimes a bit too acerbic for me. Also, I doubt this quote came from him. It’s far too optimistic. He was known for his ironic sense of humor. Big Al has the same kind of humor. Love the quote whether Sam’s or not! 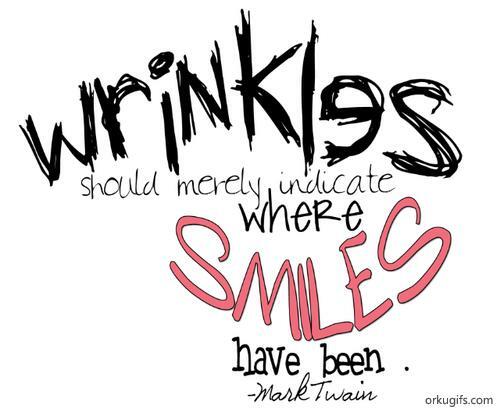 Wrinkles I have many, some from frowning, some from laughing… shouldn’t I be able to tell them apart? Brighid, just call them all laughter or wisdom lines.